The SOHC engine is the perfect example of the advanced engineering techniques used by Husqvarna motorcycles offering class-leading HP at an overall weight of just 61.3 pounds. Mass-centralization is key in the engine design, enabling chassis engineers to position the engine closer to the center of gravity for optimal handling and maneuverability. The inertia produced by the crankshaft is carefully calculated to deliver optimal traction and ride-ability from the powerful 450 cc plant. The crankshaft is specifically positioned to harness the rotating mass in the ideal center of gravity resulting in a lightweight and agile handling feel. A plain big end bearing comprising of two force-fitted bearing shells ensure maximum reliability and durability, guaranteeing long service intervals of 100 hours. The crankcases are designed to house the shaft arrangements and internals of the engine in the position that offers the best possible centre of gravity. Additionally, the position of the clutch shaft keeps the clutch above the oil level resulting in decreased friction and increased efficiency. The radiators are expertly crafted by WP Performance Systems using high strength aluminium. CFD (computational fluid dynamics) is utilized to channel air through the radiators more efficiently and provide optimal cooling in all conditions. The cooling system is integrated into the frame increasing heat dissipation by channelling coolant through the frame while eliminating the need for additional hoses. Additionally, the radiator protectors do not only protect against flying debris but also act as a brace divert any energy from an impact around the radiator and into the frame. The hydro-formed, laser-cut and robot-welded frame expertly crafted by WP Performance Systems is specifically designed with calculated parameters of longitudinal and torsional flex. Aluminum engine mountings benefit suspension functionality and feeling while retaining a light, compact and strong package. The frame is finished off with a premium white powder coating and standard frame protectors guaranteeing supreme protection and durability. 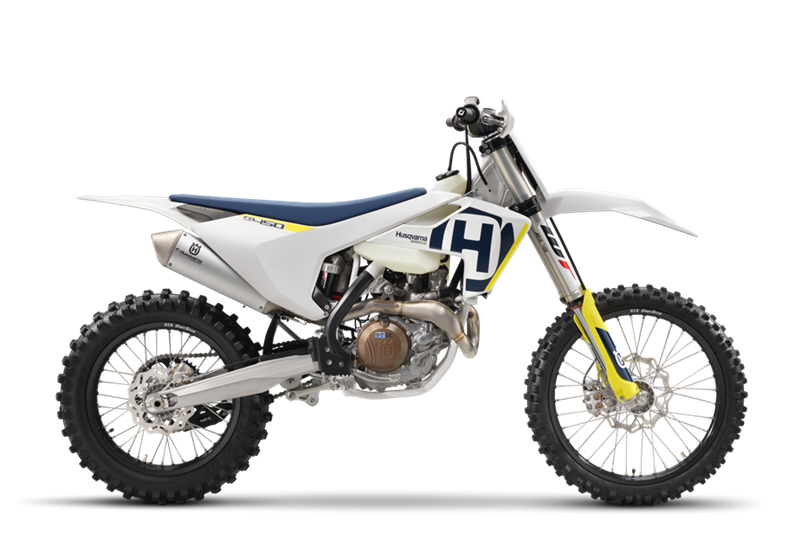 The composite subframe is a design unique to Husqvarna showcasing pioneering technologies and innovation. This 3 piece component is made up of 30 % carbon fiber making it remarkably light (1.4 kg) and also particularly strong. Specific care is taken to create a certain rigidity for optimal handling and rider ergonomics. New for MY18 is a Magura front and rear braking system. The system features a similar layout to the previous design with improved sensitivity for a more modulated feel while still retaining the highest level of performance. 260mm disc front and 220mm rear. The 48 mm split air fork features an insulated air spring and pressurized oil chamber for progressive and consistent damping. The component is lightweight and easily adjustable via a single air pressure valve for pre-load (on the left leg) as well as easy access clickers adjusting damping with 30 clicks (on the right leg). Additionally, the air pump needed to adjust air pressure in the fork will be provided as standard. The WP DCC rear shock is designed to provide advanced damping characteristics while conforming to a compact and lightweight design. With a pressure balance inside the shock, damping is improved resulting in greater rider comfort and handling while the outer contour of the reservoir increases cooling. The component is also fully adjustable and matched to a linkage system with a specific geometry to deliver the best possible traction and progression with a rear wheel travel of 300 mm. The 22 mm offset black-anodized CNC machined triple clamps feature an integrated rubber damping system that reduces vibration and increases rider comfort. The triple clamps are expertly crafted using superior techniques and materials to provide premium quality and reliability. A 3-way handlebar adjustment is standard and allows for customizable ergonomics. Optimised for easy operation, apart from changing between 2 different engine maps, the map switch also activates launch control and traction control. Traction control can be selected to an on or off position from the switch and functions by analyzing throttle input from the rider and the rate at which RPM increases in the engine. If the RPM increases too quickly, the EMS will register a loss of grip and reduce the amount of power to the rear wheel ensuring maximum traction. This can be a distinct advantage in wet or muddy conditions. The Keihin EMS is specifically designed to be smaller, lighter and faster at processing data. It integrates launch control for perfect starts, selectable engine maps via the switch on the handlebar as well as traction control. Combined with the new gear sensor, power delivery is tailored for each gear. Launch control is easily engaged from the handlebar map switch. This function limits the amount of power to the rear wheel, improving traction and preventing loss of control under hard acceleration at the start line. Along with the benefit of easy starting the electric starting system is combined with a compact Li-Ion battery which is 2.2 pounds lighter than a conventional battery. The wiring harness has been purposefully designed so that the rear subframe can be removed without having to remove any wiring.